As a boutique frame shop located in San Diego, California, FRAMECO’s Quality Custom Wholesale Framing is an intimate group of framers and designers. FRAMECO works with clients to produce the best quality, fast turnaround and offers the most competitive pricing in the industry. 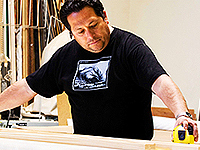 FRAMECO’s team includes Carlos Rivera, owner. Carlos is a true artist. Carlos provides the highest quality craftsmanship and professionalism. Contact Us Today – No Job is Too Big or Too Small!